When I asked Nagra's affable sales manager Matthieu Latour what to do about my on/off incidents of DC on the AC which makes the transformer of my big Zu Submission go off like a buzzing bee before going dead quiet again, he recommended Cliff Orman's Vibex from Spain. That's what they're using. I've already got a unit in house. 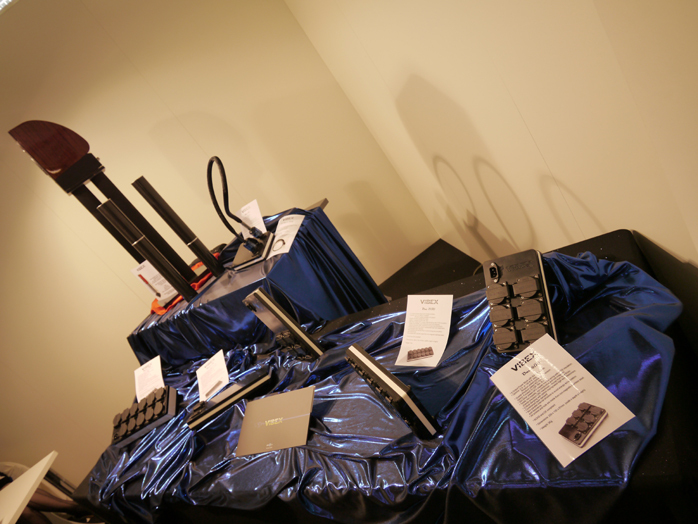 Cliff does regular power conditioners too and has a special stand for the Kiso Acoustic mini speaker. I thought this display of Swiss Vovox cables too brilliant not to cover. 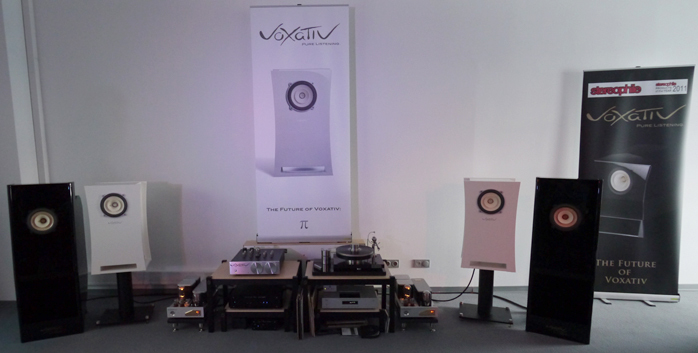 Unlike the Ampeggio from their Schimmel days, Voxativ's new stand-mounted Pi model has the requisite depth to accommodate all of the company's drivers including the big field-coil version. 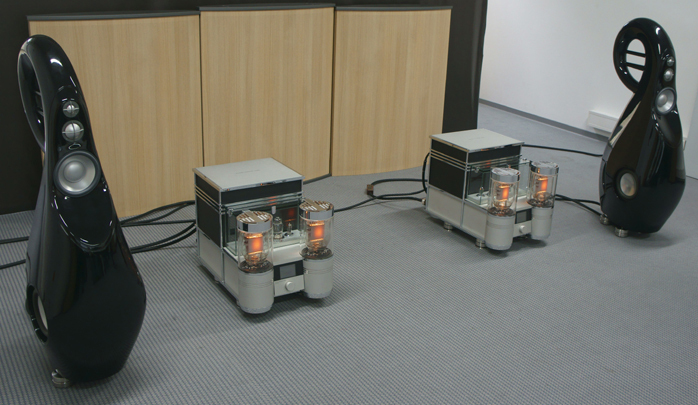 The tube preamp and monos were Voxativ's own. 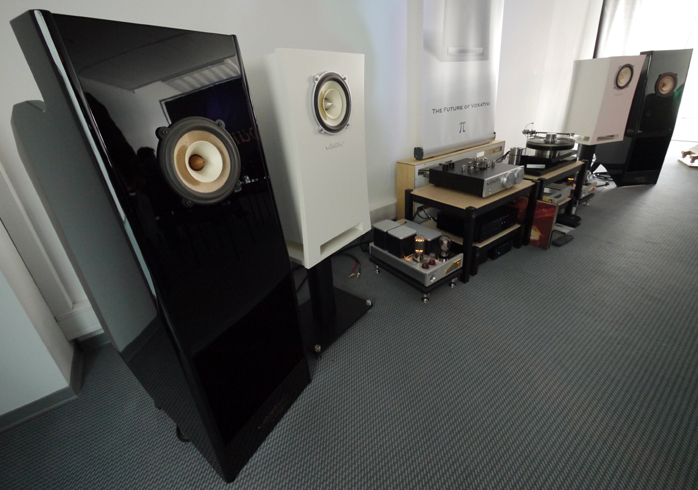 Wadax showed with Vivid and the giant liquid-cooled Audio Power Labs monos. Wadia's Intuition 01 competes directly against Devialet for another entry into the emerging hi-tech less-is-more sector..
Wilson Audio teamed up with Pass Labs' biggest and best. 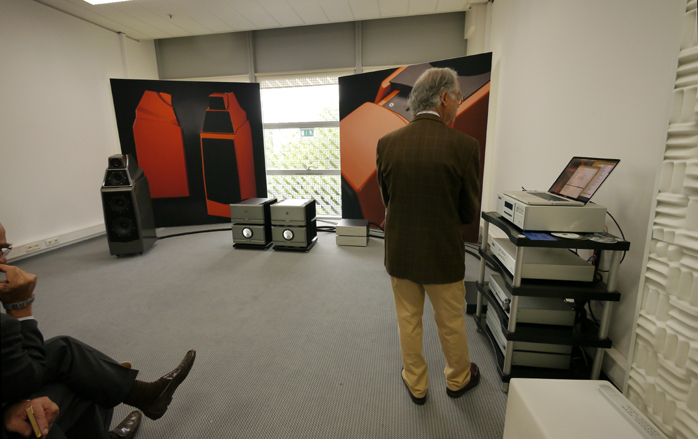 Having Peter McGrath at the controls with his own master files gave this room a definite high-in-fi advantage. 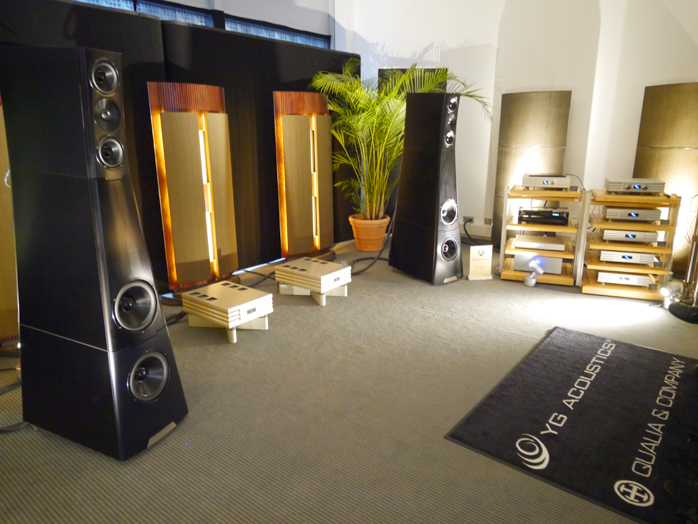 YG Acoustics with Qualia. 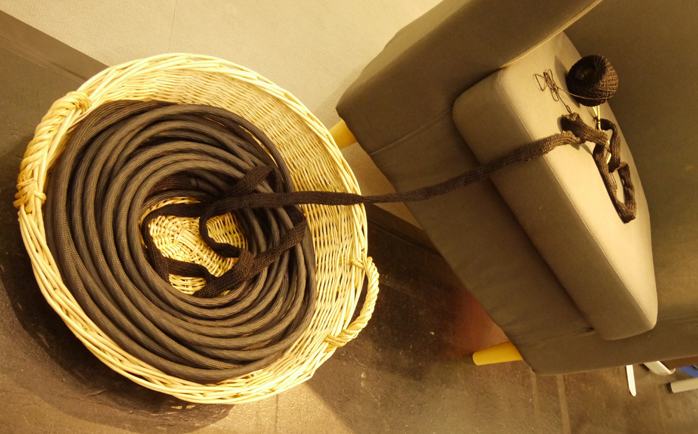 I preferred the Sonjas in the AURALiC room, a German blogger felt exactly the opposite. This again underlines how any comments on show sound are so dependent on just exactly when one enters any given room. Poland's Zeta Zero brand has a surprisingly deep portfolio spanning speakers and electronics that clearly warrant a closer look not just by our publication. Here was another Spanish rack sighting.This now concludes my coverage of the show and segues directly into Joël's commentary. Core stats according to the show's Renata Paxa? 363 exhibitors from 35 countries, 16.159 visitors total, 5.211 trade visitors from 71 countries. It really was busy! 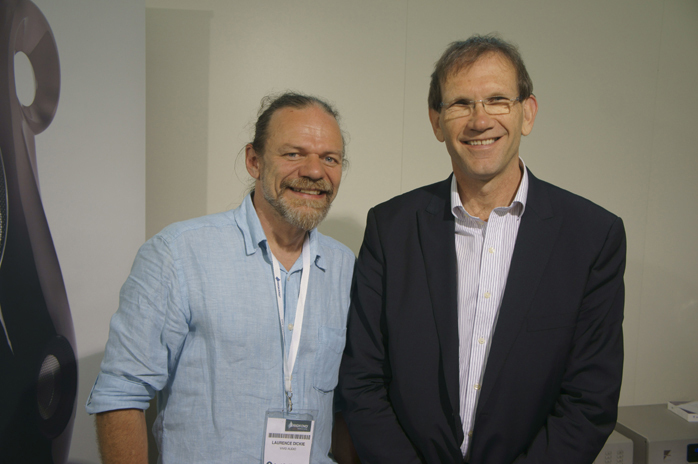 PS: In the hallways I ran into Mark Gurvey, previous head of Esoteric/TEAC Reference and M2Tech USA. This was before the parent company TEAC Japan experienced massive restructuring, consolidations, divestitures and layoffs to put him and many others out of work worldwide. Having increased Esoteric, Reference and M2Tech’s combined US presence from under $240.000 to over $5 million, Gurvey at one point was managing a $42M division inclusive of all consumer products. 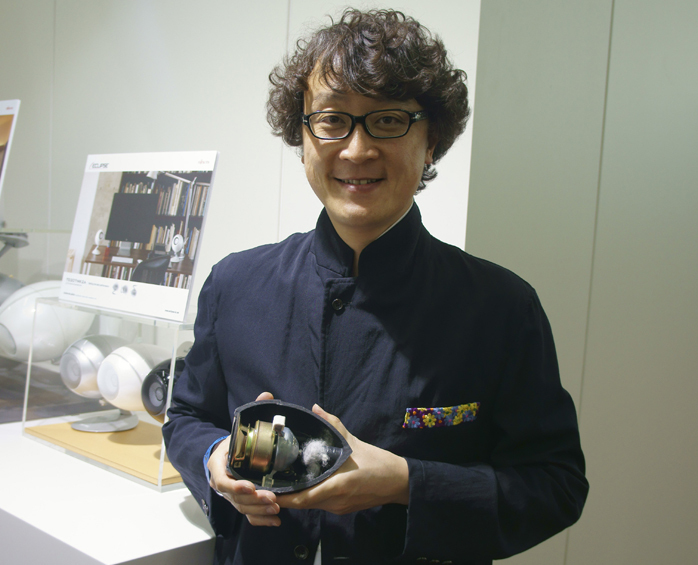 Gurvey’s previous experience includes working for Pioneer Electronics of Japan and Toshiba America consumer products. Gurvey is available as sales marketing and operations principal for interested audio manufacturers. For start-ups Gurvey & Associates have the infrastructure and connections to help select foreign brands wishing to establish a solid US presence. If that's you, email Mark here for details. Finally, if you're as much a gear head as music freak but didn't know, Munich's Beck department store has one of the largest classical and Jazz music selections in Germany, a well-stocked world music area and a large number of listening stations where you can sample CDs beginning to end without hassle. To find it is dirt easy. Face fountain and cathedral on Marienplatz, look right. Voilà. That's the building. Head for the top floor past the men's and woman's clothing and eat your heart out. Above a sampling of my visit this year (the last three titles I obviously picked up at the MOC). Hifi crusaders get lost. Low fidelity or lo-fi describes a recording which contains technical flaws such as distortion, hum, background noise, limited frequency response or grave dynamic compression. The term low fidelity is used to contrast the audiophile term high fidelity aka hifi which refers to stereo equipment that very accurately reproduces music without harmonic distortion, unwanted frequency emphasis or resonance. 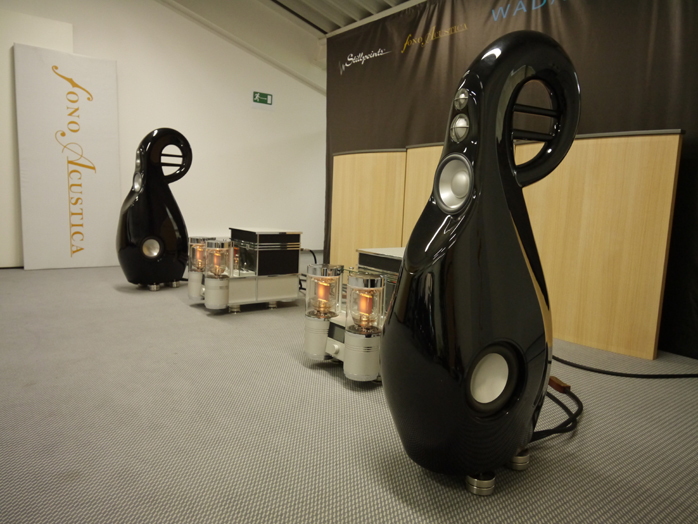 What about Munich High-End 2013? Many brands seemed to have joined the dark side of the audio force to play extremely low-fidelity sound: high SPL, no acoustic treatments and poor choices of low-quality recordings. The attendant distortion and serious room-mode resonances seemed to have no effect on their demonstration staff. The worst case in my opinion was the Avantgarde Acoustic room with their new active entry-level Zero1 speaker or tri-amped Trio G2 flagship. Who could seriously be seduced after hearing Britney Spears at such high SPL in such a poorly treated room? It would have been so simple to demonstrate certain qualities of these reference systems by playing any symphony at reasonable SPL. Everyone would have been thrilled by an orchestral performance when reproduced by such a realistic playback system. Instead I just listened twice to poor pop music at insane medically dangerous levels. Who seriously could justify the price difference between what I heard there and a decently built night-club rig? Here we were unfortunately assaulted. The damages caused to thousands of ears during these four days plus the sub wave contamination of neighboring rooms should be considered no less than violent acts of terrorism. But Avantgarde was just one example among many of these sound jihadists. My purpose here is to salute a few all too rare crusaders of real hifi or what should normally be considered an overall accurate reproduction of sound. 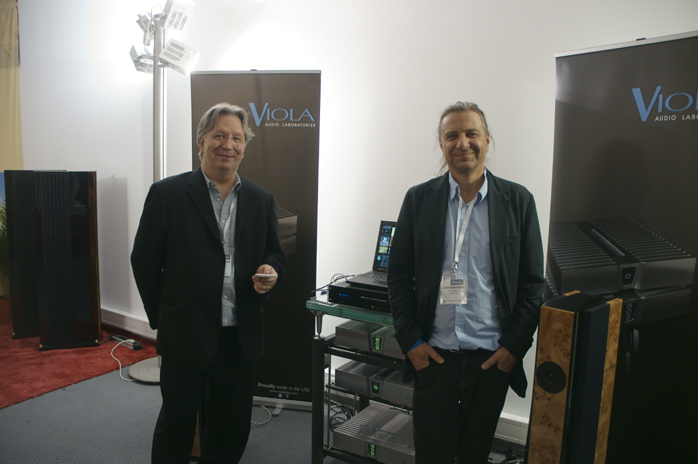 Vivid Audio was present in two rooms this year expressing two different flavors - one more analytical with the Swiss CH Precision gear and another more liquid demo with Spanish Wadax electronics. This was good on Lawrence and Philip who had no new product to launch at this major European event. Lawrence Dickie takes his sweet time to release new products. Despite constant research and development, the two lines Oval and Giya are progressively turning into a kind of timeless reference far removed from any fashionable and thus ephemeral trends. Who would have thought so ten years ago? I would also like to thank Wadax representative Rick Brown who leashed his Vivid G3 to a superb pair of unaffordable Audio Power Labs 833TNT and an interesting far more affordable Hermes streamer I would like to put to the test after my upcoming Ayon S5 review. Just after the South African and English crusaders, a few Japanese samurais gave us a chance to enjoy sonic naturalness. Here the most promising ones in my opinion were SPEC and Eclipse. SPEC Corp. offers incredibly high quality with attention to detail like other true high-end Japanese companies but with a subtle association of new class D modules with vintage-style components. Eclipse use a single drive unit to avoid phase integration concerns that are part and parcel of any multiple-driver arrangement. That single drive unit is held rigid by a dense anchor inside the enclosure which diverts any vibrational energy into the dedicated stand as another example of timeless design. 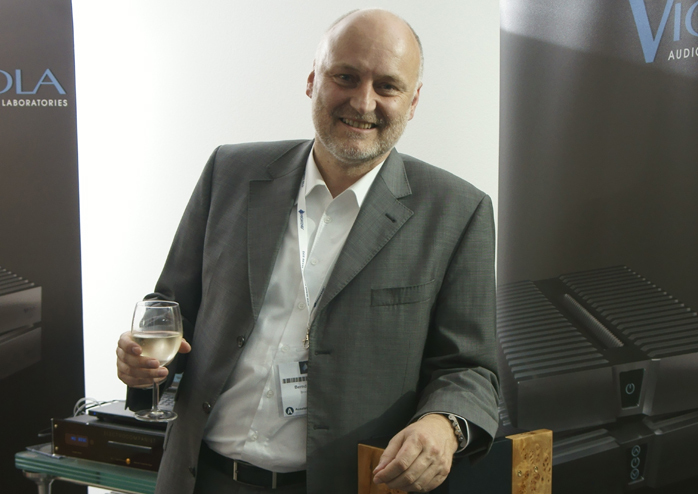 Gerhard Hirt, founder of Ayon, demonstrated a full and convincing Ayon system with new and impressive loudspeakers, amplifiers and the S5 network player. 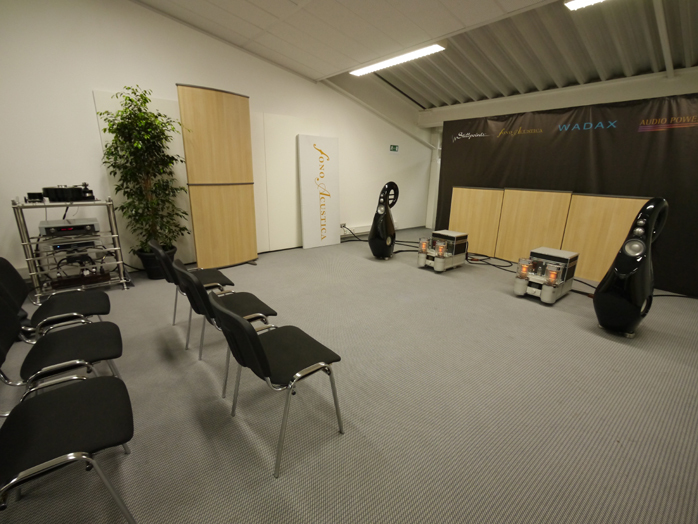 Brodmann Acoustics conducted a very minimalist but efficient demo. Their little FS bookshelves delivered an outstandingly wide three-dimensional image at a very reasonable price. 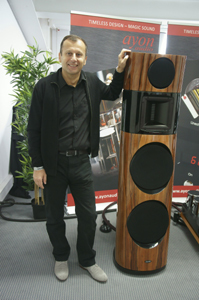 Bernd Gruhn explained that the Brodmann speakers are designed by Hans Deutsch who had previously licensed his designs to Bösendorfer. When that company withdrew from the speaker business, Deutsch approached Brodmann. Gruhn also explained that unlike the Bösendorfer designs, Brodmann's vibrating panels on each cheek are loosely coupled to the enclosure to minimize colorations and allow the benefits of large radiating areas at low frequencies to be realized. The new Viola electronics (Concerto & Crescendo) in association with the Brodmann speakers gave a very neutral and lively result. 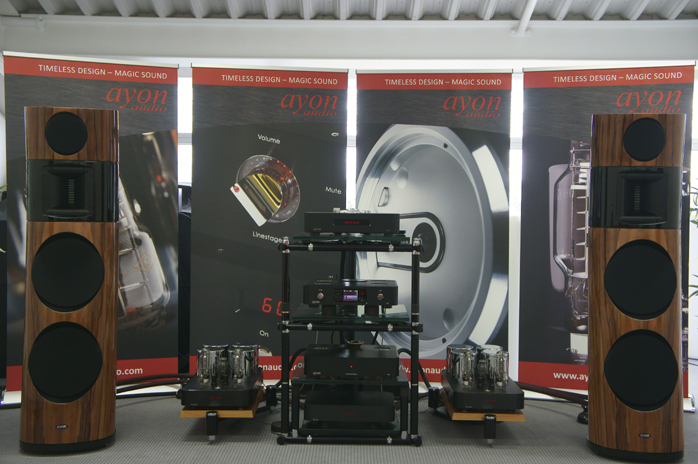 Last year's revelation Lawrence Audio mainly demonstrated their Cello floorstanders driven by Jeff Rowland electronics. 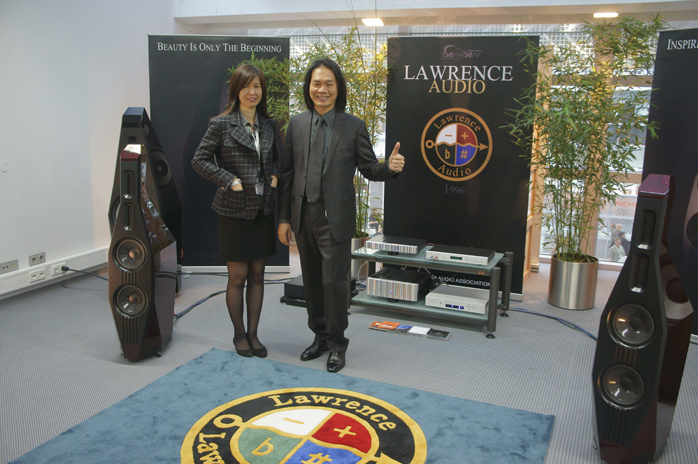 Despite show circumstances and amplification not being my first choice for these Taiwanese speakers, Lawrence Audio demonstrated to have very involving versatile products. 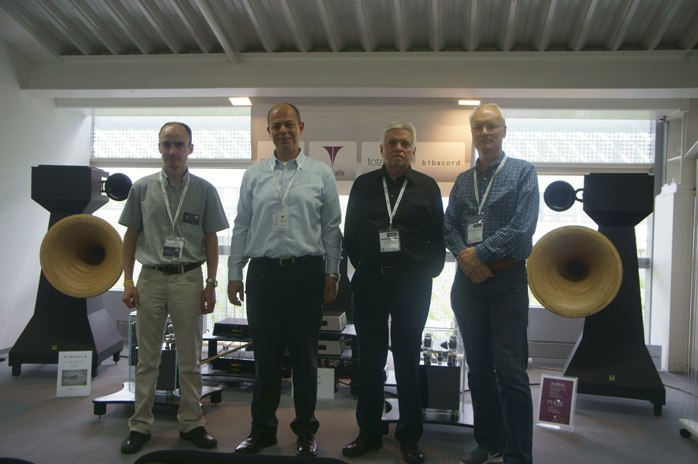 Vincent Brient of TotalDAC celebrated his first participation at an international audio exhibition with a promising partnership with Tune Audio and Engstrom&Engstrom. The room had insufficient acoustic treatment to deliver the system's full potential but was in my opinion one of the most interesting alliances of the show. 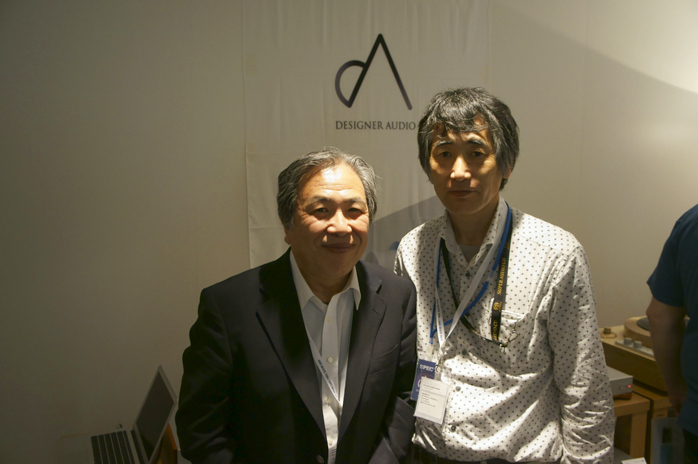 Totaldac presented its new digital streamer and reclockers as well as a new tube version of the D1 Dual DAC. Other interesting demos were the Eventus/MSB demo and Leonardo speakers despite the GrandiNote amplification being underpowered to handle 100% of the panels' capabilities. All these guys were perfectly aware that music cannot be served up with the highest SPL and most elephantine infrasonics. The real thrills reside in the sensation of being where the life event took place but not a giant night club. I understand that marketing and new ways of listening can justify the different orientation expressed at an audio show. But is it really worth it in the long run ? 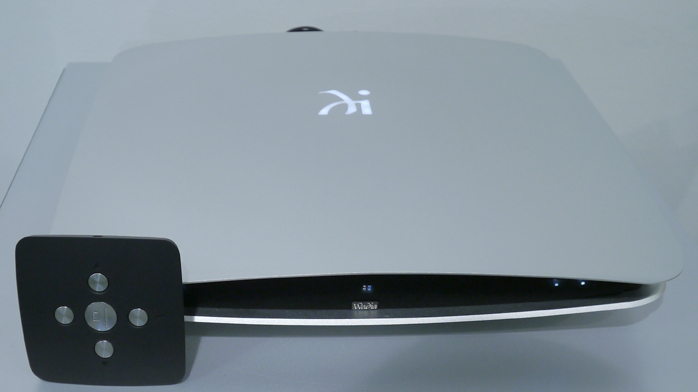 To end my short feedback I must highlight newcomer Le Son who will introduce this year its first two electronics, an amplifier and streamer/DAC whose development is already at an advanced stage. 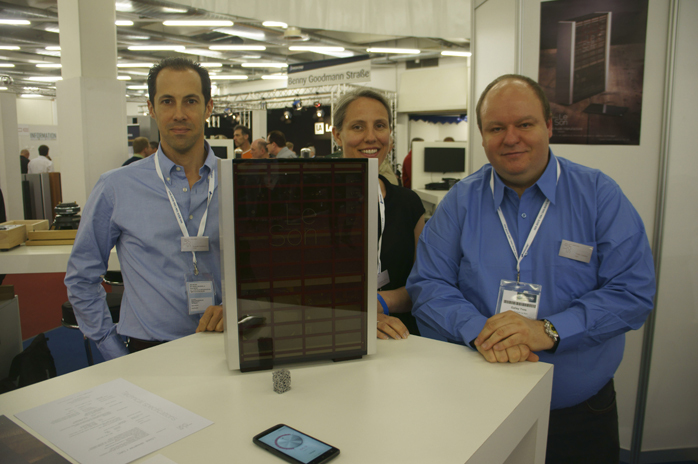 This Swiss startup uses innovate material such as foamed aluminum for its very good acoustic and cooling features. 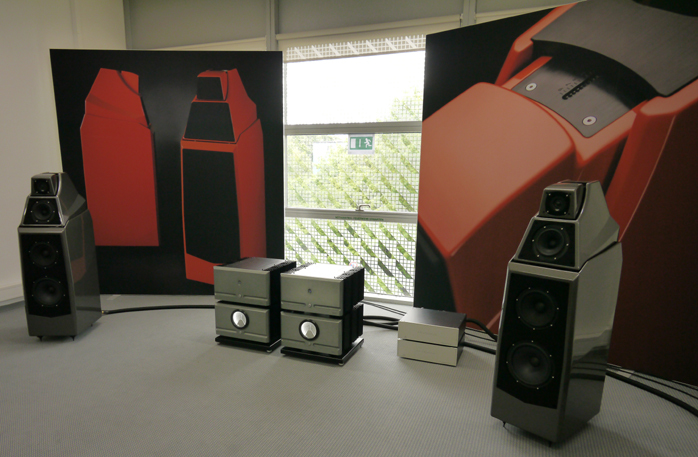 I hope the Swiss team driven by CEO Yves Galley will soon join the group of the last crusaders of true high-end sound.